Wintry Whimsy! Turn the season’s frost into a warm touch for your home. 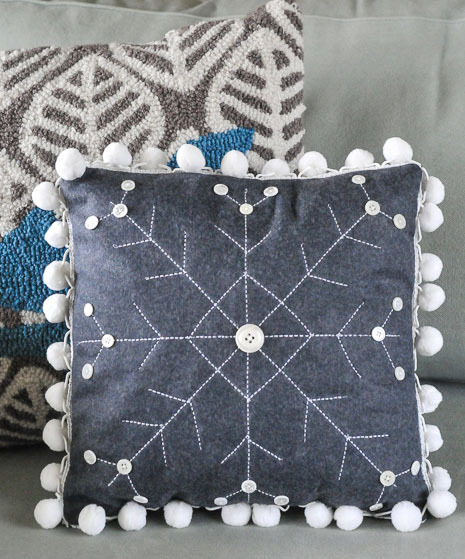 Nothing embodies the charm of winter like this snowflake pillow. 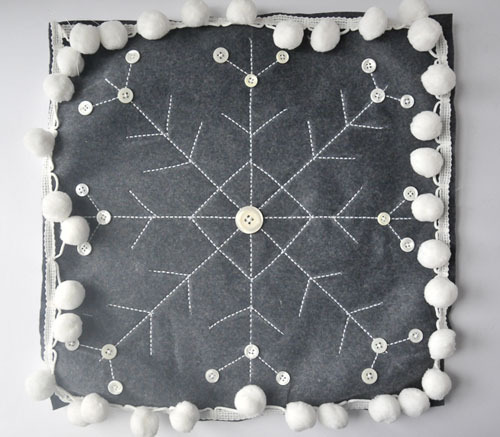 Tip: Contrast the cold snowflake motif with a warm and fuzzy fabric like flannel or wool felt. Step 1) Create the snowflake outline. Using a chalk marker and gridded quilters ruler, draw lines marking the vertical and horizontal centers of one 14″ square of felt. 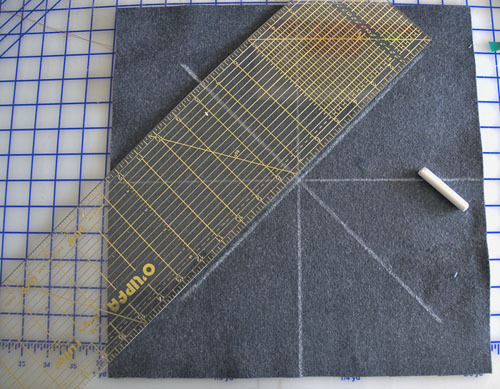 Using the 45° angle marked on the ruler, draw diagonal lines through the center of the felt square. 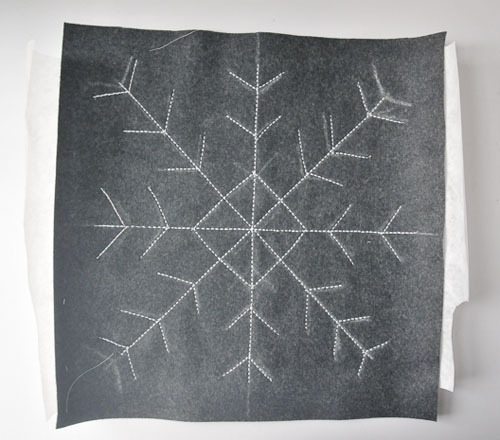 Draw additional lines as desired to make the snowflake shape. 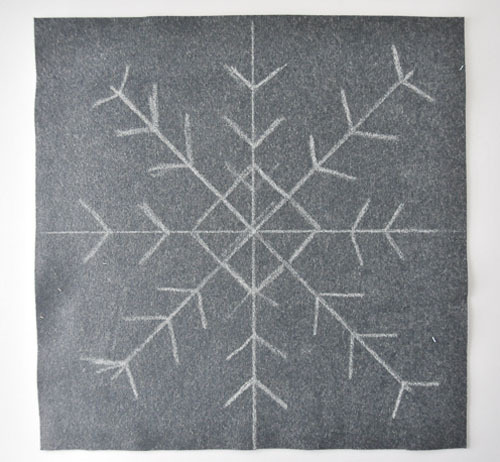 Step 2) Stitch the snowflake design. Pin the tear away stabilizer on the back of the 14” square of felt. Install the Wing needle in your sewing machine and thread the machine with white thread in the needle and on the bobbin. Tip: A Wing needle has two “wings” that extend out from the sides; these make large holes in the fabric to create a hemstitched effect. I used a special heirloom straight stitch (#713) on my BERNINA sewing machine, designed to work with a Wing needle and create a hemstitch effect. To do this, it sews back and forth six times before moving on to the next stitch. This heavy straight stitch, with six side-by-side strands of thread, looks like a hand-sewn backstitch. 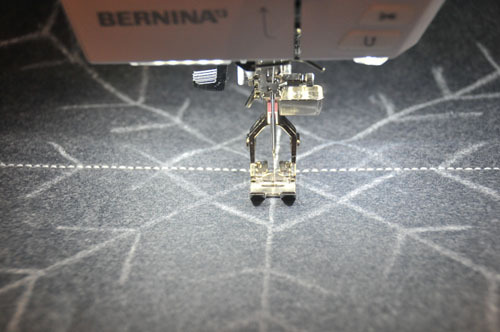 Tip: If your machine doesn’t have a hand-look backstitch, try using a triple straight stitch (#6 on most BERNINA sewing machines) and/or a heavier thread, such as a 30 weight cotton embroidery thread or 40 weight cotton quilting thread. Adjust the stitch length to 4.o mm to approximate the look of a hand-sewn backstitch. 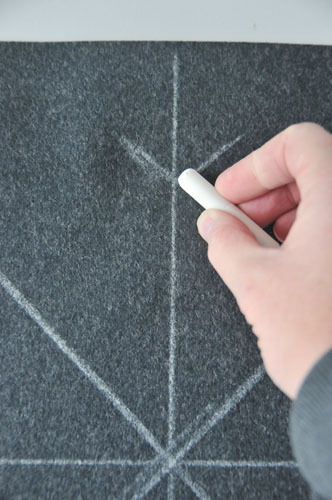 Begin sewing down one of the chalked lines. The machine will make six back-and-forth stitches before it moves on to the next stitch. Complete the line, moving at a steady pace and staying on the lines. Stitch all of the lines on the pillow, pivoting where necessary. Leave thread tails at the beginning and end of each line of stitching; later these will be pulled to the back and tied in knots to secure the stitching. After you are done with all the stitching, very carefully remove the tear-away stabilizer. Be careful not to pull out the lines you just stitched! It’s okay to cut some of the stabilizer away if needed; just be sure you don’t cut your stitches. Pull all thread tails to the wrong side of the pillow front and tie them in knots to secure the stitching. Clip, leaving thread tails about 1/2″ long; these will be on the inside of the pillow and won’t show. Step 3) Sew on the buttons. 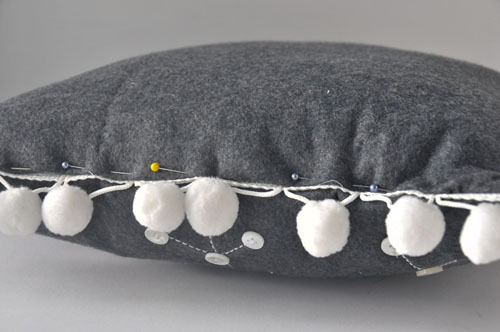 Sew buttons to the pillow front as desired. I stitched 3three to each end of the snowflake and one large button in the center of the pillow. 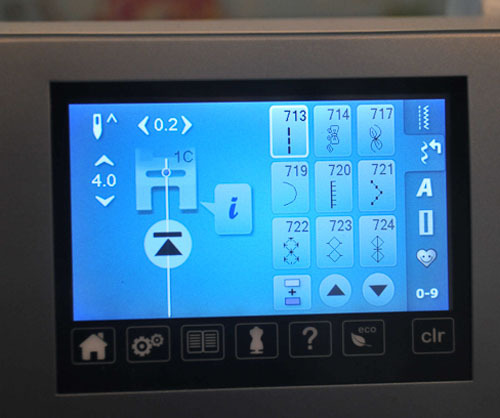 Tip: Rather than stitch so many buttons on by hand, let your sewing machine do the work for you! 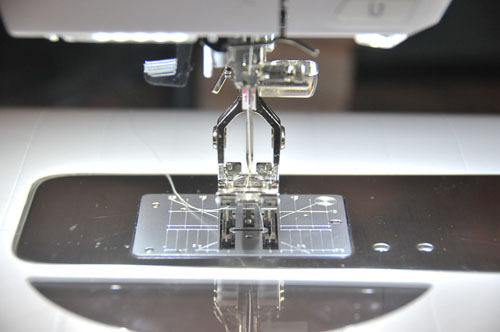 Use a button-sew-on foot and stitch if your machine has them. For my BERNINA this is Button Sew-On Foot #18 and button sew-on stitch #60. 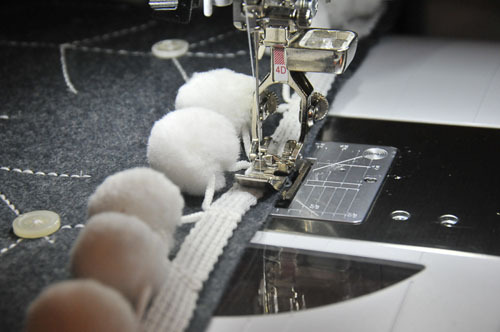 For other machines, see Susan Beck’s “Three Little Stitches” post on sewing buttons. Step 4) Add the pompom trim. Using a zipper foot with the needle moved all the way to the left (or the guide moved to the right, depending on your machine’s zipper foot design), sew the pompom trim to the edge of the completed pillow front. Using a zipper foot with the needle moved to the left, sew the pom pom trim on the edge of the completed pillow front. Step 5) Complete the pillow. Pin the second 14″ felt square to the completed pillow front, right sides together. Stitch them together sewing just inside the line of stitching used to attach the pompom trim, leaving an 8″ opening in the middle of one side. Turn the pillow cover right side out through the opening. Slip in the pillow form. Turn under the edges of the opening and pin them together. Slipstitch the opening closed by hand. Previous Previous post: Embroider BIG with BERNINA! I was particularly interested in how the pom poms were sewn on and found it confusing because I think you changed the order of the second and third photos. Plus, I do not know why there were two lines of instruction about using the zipper foot with the needle position to the far left to sew the trim on the edge of the completed pillow front.